Mattel has launched additional lines within their Barbie toy range for spring 2019 that are available now from wholesaler Baby Brands Direct. There are 15 new toys that trade account holders can add to their in store offering from Ken’s clothing accessories to Barbie’s first helicopter. 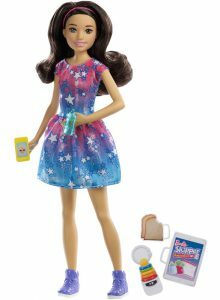 In addition to this, 2019 is a major milestone for Barbie as its her 60th Anniversary which has led to some special additional dolls and marketing activities. 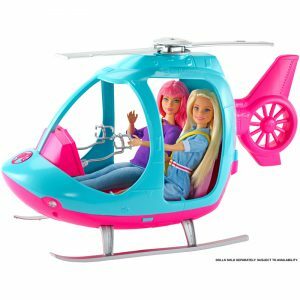 Barbie has 2 new travel themed lines, as above her stunning new helicopter in pink and blue (SRP £29.99) can sit two dolls (with seat belts) and has a button to activate moving rotors on the chopper. This new addition is bound to have fans excited and imaginations taking off! Barbie estate lines i.e. the large accessories that the dolls can be used with have proved to be highly successful for the brand with higher revenue and profit potential for retailers. Her convertible car and moped stay in the range and are core lines that are highly recommended for toy specialists. Barbie is also available with travel accessories including a suitcase for combined use with the helicopter or for when she is taking commercial flights. The travel doll set includes cute accessories like a phone, camera, headphones, head pillow rest, rucksack, sunglasses and a cute puppy that little ones will love to create exploration story times with. A considerable area of growth within the Barbie range last year at Baby Brands Direct was the increase in sales of the Barbie Babysitter range. In particular, the Babysitter playsets were hard to obtain stock of that included Skipper, a baby or toddler with appropriate accessories such as a highchair and cot or changing table and potty or pram. This continues in the range and this season additional lines are available including a bath time set (available as a solid) that has Skipper with a toddler and a bath tub. Furthermore, the bathtub can actually be filled with water, and the interactive doll with button on her back will lower her arms to make a splash in the tub when pressed. Another great addition, is Skipper as a doll with small babysitter accessories such as a bottle, phone and toys. Best of all the doll is available in both genders and a range of skin tones and looks. Siblings can also now be stocked for kids as dolls without accessories also in a range of ethnicity and come as a 2 pack with one baby and one toddler. Finally, there is also the option of the story telling assortments which each include a toddler doll and playground piece or one of two sets with a baby doll and stroller with rolling wheels and a removable baby seat. The range of babysitter dolls, toddlers, babies and sitter accessories is now wholesome with mix and match availability to suit each preference, personal collection and budget. Chelsea is best known as Barbie’s little sister. Sales of her as a doll have steadily grown as have the suitably sized playsets available. This Spring 2 new playsets are available wholesale, the Clubhouse and Bedtime. The former offers 2 stories of activities with a working elevator to link them. 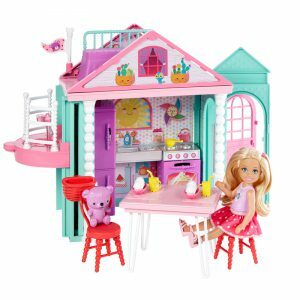 It also includes one doll and lots of furniture and accessories for creative story telling including a bed, dinning set, sundaes and more. The Bedtime set includes a doll dressed in a night shirt and slippers, blue bed, nightstand, teddy, clock, blanket, pillow and bedtime drink, perfect for kids to tuck up their favourite doll. Also new to trade are 3 different accessory packs for the Chelsea doll that includes accessories in the themes of ballet, bedtime and rain – great for add on sales. Dreamtopia is a significant segment within Barbie, and toys available for supply to trade include an assorted selection of Barbie Mermaids each beautifully decorated in a choice of 4 colours. There is also for the first time ever a Ken Mermaid – available as a solid with a blue and purple tail. All the dolls bend at the waist so kids can move their dolls as if they are swimming along. This year is a special year for Barbie toys as it celebrates its 60th anniversary in business and will see activity in the media and have special edition dolls through the year. For Spring the career line will be boxed with the special 60th logo and include a selection of modern career dolls including a firefighter, astronaut, pilot, football player and political candidate. There is also a new playset, that is sweet as can be especially for dog lovers coming with Barbie, 2 dogs, 2 puppies and accessories to care and interact with them. The realistic touch to creative play is that the dogs each have responsive actions, feed one the bones and it will poop and give the other water to drink and it wees. In a recent meeting at Mattel’s head office we learned that they have specifically developed the Ken’s shaving playset as a result of research showing little girl’s interest in watching their Dad’s shave. This playset comes with a Ken that has a colour changing beard and a full vanity unit. When kids apply the cloth and cold water to his beard it will appear and then they can use the sponge-tipped “razor” with warm water to “shave” it off. The set comes complete with many other small bathroom related accessories to extend imaginative play. Plus with the increased popularity of Ken we have added to our wholesale offering his fashion accessories, now kids can access additional clothing sets for a new look and different activities. There is so much for retailers to select from the wholesale range of Barbie toys available from leading distributor Baby Brands Direct. Trade account holders can log in to view prices, download product CSV files and image folders as well as place orders with a quick dispatch. Retailers looking for a reliable supplier of Barbie toys for their store can apply for an account here.